Learn about some dynamic demand experiments that did not blow up my kitchen (much), and the Nesta competition! How can we help make electricity demand at home better fit availability from renewables, to help keep down the cost of energy? DHD's Dynamic Demand playpen (hardware/software repository at SourceForge). Along with reducing domestic energy demand generally (eg with the OpenTRV project for heating controls), or working out when to shift load on a larger scale to times of lower grid demand and carbon intensity, I'd also like to begin to make domestic demand more controllable dynamically such as to match my dishwasher's demand to my PV generation as well as possible, and even drop demand when the whole grid is struggling. These last two items reduce losses in the distribution system and excessive demand on the transmission grid bulk generation, and help make integration of intermittent renewable sources easier. To this end I have started work on (well, tinkering with) a series of designs that might work at home for me for appliances such as the kettle, toaster, slow cooker, gas combi central heating (possibly in conjunction with OpenTRV), and even with a future heat-pump replacement. These designs are intended to be proof-of-concept, and would need a lot of product/cost/UI/etc engineering to be retailable. It should be possible simply to plug an appliance in via one of my gadgets (with another gadget in the consumer unit monitoring mains voltage and power flow in and out of the house for the whole house), and become a much more grid-friendly citizen. This is primarily an attempt to improve power flows as seen by the DNO/grid, but depending on the characteristics of my import and output meters, this may also reduce my bills and show improved self-consumption, getting us nearer to zero energy imports to match our year-round zero carbon footprint. This page will outline the designs and whether they work as intended. 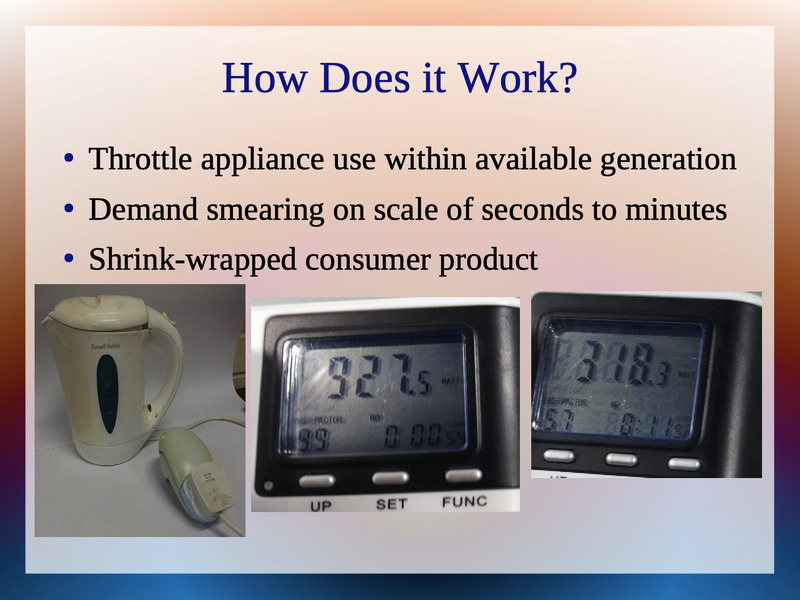 Be able to drop random half cycles from a simple appliance resistive load such as an electric kettle to achieve (PWMed) reduced instantaneous power demand. Be able to monitor mains voltage and current at the consumer unit, and thus power flow direction into or out of the house given local microgeneration and local consumption. Be able to communicate house power flow direction (and approximate magnitude) to appliance control units and indeed for general monitoring and display. Be able to monitor (and broadcast) mains power frequency to be able to reduce appliance demand when the grid is under strain. 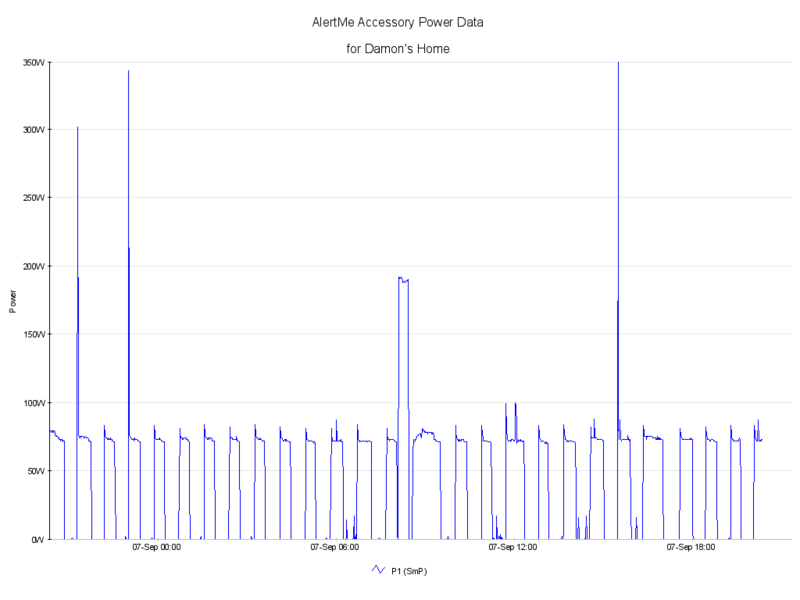 Be able to monitor (and broadcast) power consumption for a single local appliance. High grid demand (eg for "peak shaving"). Drawdown from grid-attached storage (implying round-trip losses and insufficient non-callable generation from renewables to meet demand). High grid carbon intensity (gCO2/kWh). High time-of-day rate when domestic/retaildynamic pricing arrives. There is some innovation in use of random dropping of complete half-cycles to appliances to help stochastically smooth total load seen by the grid/DNO/substation while minimising electrical noise. Also, many appliances should not need modification and should be able to plug in through this device just like a timer or power meter (or equipment could be fitted at the consumer unit). The implementation will probably use the same sort of slow-start / exponential-backoff techniques for sharing the available power without explicit central control that are well known in network technologies such as WiFi/Ethernet and TCP/IP. 2012/08/04: see 2013/08/04 "REV0" snapshot of PCB design. 2013/09/01: see schematic and pictures for 2013/09/01 assembly of "REV0" board. 2013/09/14: sample SSR input when in trickle mode (one half-cycle in three enabled) showing random drop of a single half-cycle near the middle of the trace. Test with LED lamp on 1:9 dropping results in periodic bursts of flicker, possibly due to drift between AVR clock and mains. Test (@1:9) with dishwasher intending to perform a rinse cycle resulted in control panel lights going on and off sporadically and ticking noise from SSR; I did not try to initiate a cycle. Kettle worked fine at 1:19 dropping as expected, as did toaster. Dishwasher still semi-bananas and visibly and audibly unhappy at 1:19 (slightly less so at 1:29), though I was able to start a rinse cycle. At 1:37, ie a little less than 3 dropped half-cycles per second, the dishwasher logic seemed to mainly retain its sanity, though still with some flashing lights, but the pumps and valves were audibly unhappy, eg the inlet valve shutting completely on each dropped half-cycle resulting in significant banging/hammering. This model does some hammering anyway, but not quite so much! It's an overcast morning and our ~5kWp (big) rooftop PV is generating ~300W. If I boil water for a cuppa in our 1kW travel kettle (~30Wh or 0.03kWh), one third of it will come from our roof, and ~20Wh will come from the grid, with up to ~2Wh of transmission and distribution losses. If I use the DD1 set on 3:1 trickle (only one half-cycle in every three allowed through to the kettle) then essentially all the energy will come from our roof and the ~2Wh of transmission and distribution losses are eliminated. If I were to use a 3kW kettle only 10% of the energy would come from our roof and transmission and distribution losses may be up to ~3Wh; I could run this at 9:1 (or lower ratio) trickle to get back to 100% local consumption with DD1. Actual T&D losses may be lower if power flows are local, but this illustrates how DD1 may be able to save up to 10% consumption carbon footprint by matching demand to local flows. Note that I do not assume that switching to 100% local microgen eliminates the carbon footprint of my cuppa for this; the energy spilled to the grid would otherwise have reduced footprint elsewhere. Photo of two-layer partial case in green PLA, and see previous images also. Lid with holes for buttons, sensors, etc. Spacer collar (~3cm) providing room for buttons to project down, etc. Thin upper collar for cutouts above the PCB, if any. Base and under-collar for cutouts below the PCB. Includes screw slots for wall mounting if desired. This could be two layers. PCB has very/too snug fit in retaining lip; maybe 0.5mm more space should be carved out. Likewize M3 bolts won't go into printed 3mm holes: need to allow extra tolerance for printing spill, etc. Wall-mount screw keyholes may be upside-down (reference 'up' is as PCB appears on screen in Eagle). There is an unexpected bridge left in scad files currently over hole for extra power-supply cap board fix! Half-cycling on the grid can be a problem for other devices than the one being half-cycled. The parasitic resistance in the pole-pig transformer and the wiring from it means you can end up applying a nontrivial DC component to the input power of other loads. This DC component can result in a substantial current in the input winding of any transformer-powered device on the same circuit - or even the same drop. That, in turn, can result in the transformer saturating. Then its inductance drops a couple orders of magnitude and it pulls massive current until a fuse/circuit breaker blows (or it burns up). DD1 reached the semi-finals of the Dynamic Demand Challenge (timeline) and was at the Hackathon starting 2013/10/18. Jon S and Martin F were in the team along with me (Damon HD); many thanks to them! Here is a modelling spreadsheet constructed during the event by Jon and Martin based on real PV generation (from my roof) and real consumption data from a family that might install PV but is not currently very energy aware. See plug-in unit mockup and demo set-up for the pitch. Here was the final pitch (as .ppt), which we'd still be happy to take forward with a friendly solar PV installer and/or energy retailer, though we'd also be very happy to help someone else make it happen! A controller for a grid-interactive inverter/charger to shift/shape/eliminate household demand intraday as seen by the grid to some combination of times when (a) carbon intensity (gCO2e/kWh) is at a daily low (b) HT grid/demand is at a daily low (c) there is no draw-down from grid connected storage (d) grid frequency is not low (e) retail/wholesale price is low. Innovative because: it uses public data sets and local data measurement, including of any local microgeneration to minimise energy flows in and out of the house/building (and thus distribution/transmission losses) to save money for the end user and other participants, shave peaks, and minimise household/building carbon footprint. Neither V1 or V2 of the UK's smart meter spec is amenable to facilitating direct communication between kitchen appliances that have most DD potential and smart meters (and other sources) to help provide DD. This is for security and cost and convenience reasons; IR technology is inherently better in these regards from the appliance point of view and more likely to get integrated by manufacturers and accepted by users. 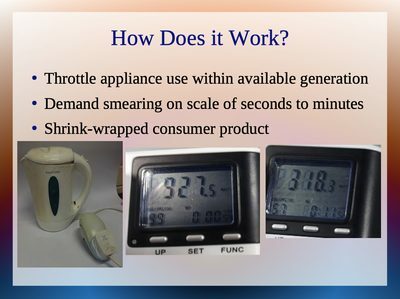 Innovative because: this simply and security and cheaply helps overcome the mismatch between the smart meters very high security demands and simplicity (UI) and cost restrictions of kitchen appliances, and also allows other sources of local DD trigger, such as matching local microgen output, to be integrated. My fridge/freezer runs day and night and uses a constant amount of energy per day though rather spiky (~40W mean is ~50% of running draw ~80W, and start surge is ~10x mean ~400W). However, my fridge/freezer draw is less than even mid-winter average generation from my PV; can I make it 'disappear' from the grid and improve/increase my PV 'self-consumption' (and reduce the need for storage or fossil-fuel flexible generation on the grid itself)? Here's the simple version: take a grid-interactive inverter with about a day's worth fridge/freezer of consumption as efficient (Lithium-chemistry) battery storage, or a little less. Eg for me ~1kWh of battery. The fridge/freezer has just disappeared from the grid. That would be 15%--25% of our current base demand year-round. At a very rough estimate a suitably smart inverter plus battery might cost very roughly 1x--3x the fridge/freezer circa 2014. The hardware could outlast the fridge/freezer, the by-then reduced battery capacity maybe still matching the reduced demands of a more efficient appliance. This could work for anyone with a decent sized PV array (eg ~2kWp south facing) and an A+ or better fridge/freezer (~1kWh/d consumption). The bonus could be extra protection of fridge/freezer contents in an area prone to frequent power cuts. Clearly this can be augmented to avoid drawing any power when grid frequency is low, and charge outside normal hours when grid frequency is high, to help stabilise the grid dynamically. Additional more invasive cleverness would be to lower the temperature set-points slightly when PV is generating (to store extra 'cool' in the fridge/freezer), eg with tech such as Green Bean post-hoc perhaps, or designed in. Industrial cold stores do this already (eg store 'cool' from cheap electricity) for example. If someone was determined and prepared to do some significant re-engineering, eg to build a fridge/freezer with variable-speed compressor and variable temperature set-points that matched (or stayed under) available instantaneous local RE (eg PV) generation then quite a lot of the benefit might be had for free or close to without any electric storage at all. Thanks to AW for helping me bat this idea about in email! 2014/11/03: why not have your ADSL or cable modem take itself off the grid at peak times (or when grid frequency drops)? Typically a small always-on load, a modest internal battery would give them the option of coming off the grid for a little while at peak time, and surviving brief mains drop-outs too. The device clearly has easy connectivity to monitor when the grid needs extra help, and even to warn other devices in the home over the home/office network. 20 million UK home routers at ~10W each would be 200MW of virtual power station. There might be ~30p (£0.30) income per device per year from National Grid via demand-side aggregators to cover typically 6--7h of frequency response (FCDM) per year for a maximum of 30 minutes at a time, so a device good for three or more years might have £1 to cover a ~5Wh rechargeable battery, and/or might be able to go into a slightly power-reduced mode to reduce demand. Alternatively just being able to cut power demand by 10% might be worth a few pence per year at current prices. Retail NiMH is ~£1/Wh. 2015/05/22: see UNplug solar controller aims to help you take your fridge off the grid. *By fun I mean being kind to the electricity grid. 2014/11/14: a thought experiment. Suppose that you have a decently-sized grid-tied battery "behind the meter", eg of the form used to improve "self-consumption" of microgeneration and to reduce local flow peaks; what algorithms might you apply to maximise savings on imported electricity and to be as kind as possible to the grid? <25% full and if your system has a transfer switch (ie can keep your lights on when the grid goes down): then at this point you may be prepared to (pay to) import grid power to charge the batteries to keep an emergency minimum to keep lights on when the (next) power cut comes. To be kind to the grid you may wish to charge relatively slowly, and delay and/or ramp up slowly after a power cut is cleared and/or at times of peak grid demand (etc), to avoid overloading the local grid as everyone's power comes back at once. < target 75% full: generate as fast as necessary/possible from batteries to minimise imports or charge the batteries with as much as possible of spare microgeneration (ie in excess of local consumption in the house) that would otherwise be exported (or spillied) to the grid unless real-time prices are high and/or grid demand is at peak and/or grid carbon intensity (kgCO2e/kWh) demand is at peak when the batteries can be charged more slowly to export more. else: generate as fast as necessary/possible from batteries to minimise imports then use only a proportion of any excess microgeneration for charging so as to maximise exports, unless the real-time export tariff rate is low (if you are on one) or wholesale rates are low or the local grid is congested (eg voltage is high) in which case charge the batteries at a higher rate. The exact thresholds can be adjusted to taste, as long as their order is kept. On top of that you may wish to provide grid frequency support out of the goodness of your heart (or possibly for a small fee from an aggregator) which as a minimum means reducing demand when the grid frequency drops below a reasonable threshold, eg because a generator has unexpectedly gone off-line. This is known at a large scale to the National Grid as a 'balancing' service called Frequency Control By Demand Reduction (FCDM) and is worth ~£35/year per kW of guaranteed availability, though only of interest to National Grid in blocks of several megawatts! In this case you might want to override the basic algorithm above to export as much as possible at times of low frequency, eg by reducing charging to the battery or even exporting from it, possibly in proportion to remaining battery charge above (say) 50%. At times of high frequency you can minimise exports (and without causing additional expensive imports), eg by charging the batteries faster or higher than would otherwise be the case. These responses can be made proportionate to the deviation of frequency from the nominal central value to provide 'dynamic' (smoother) frequency response. 2013/08/09: Dimmers and sparse-sampling home energy monitors don't mix. 2013/07/29: Solar Power: The Shift To Self-Consumption. See G83/2 5.3.1 Interface Protection Settings and Test Requirements including "The Manufacturer must ensure that the Interface Protection is capable of measuring voltage to an accuracy of +/-1.5% of the nominal value (+/-3.45V) and of measuring frequency to +/-0.2% of the nominal value (+/-0.1Hz) across its operating range of voltage, frequency and temperature," suggesting general tolerances and timings for grid interaction as well as the V-13% (200.1V) undervoltage stage 1 trip level. The Dynamic Demand Challenge; timeline. Photo Voltaic - Immersion heater power diverter in PICAXE forum (and 1Wh energy-borrowing notion). ISY994iZS/IR PRO Smart Grid Enabled INSTEON-Compatible, Zigbee-Compatible Home Automation Controller. First published 2013-07-22 , updated 2019-04-18 , rebuilt 2019-04-19 . Site copyright © 2007-2019 Damon Hart-Davis. Hosted by ExNet.